Christian is a producer, director and choreographer based in London and regularly working in Asia. He is principal of Superstars in the Making® (SITM®), a performance education company he set up in 2009 and co-founder of Dramalang® education. Following on from his grandfather Ron Brown, who made a substantial impact on the arts scene in South Wales, Christian was born into a family of theatre lovers. From the age of 12 to 19, Christian produced, directed and choreographed his own community productions with hundreds of children from the South Wales area, launching a youth company Act4Fun. It was here that Christian developed and nurtured the invaluable skills required to take on a multi-role approach to creating theatre. He also attracted government funding and raised all of the capitalization for every production. 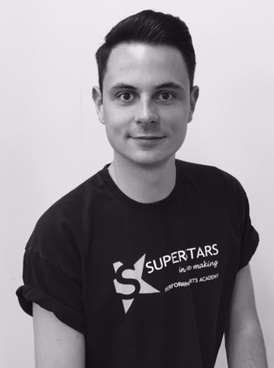 At age 19, whilst in year 2 of his degree, after 2 years of planning, Christian opened Superstars in the Making (SITM), a focused and professional training centre for young people. By 2014 this company was operating in China and has, to date, trained well over 5000 children and young people, whilst boasting a strong alumni of performers now working and or training professionally across the world. His aim for SITM is to inspire young people to believe in themselves, lose self-consciousness and provide them with the correct and safe technique required to build a strong foundation for a bright future in performance or any career. Christian then went on to gain a First Class BA Honors degree in Drama from The Atrium, Cardiff. Following this, Christian trained as a qualified dance teacher at Dance Academy South West and Urdang Academy, London. Christian is also a qualified karate instructor and has an extensive knowledge in fitness and health. 2018: Christian directed the UK professional premiere of "Island Song" A new musical by Carner and Gregor, performed at The Tristan Bates Theatre, Covent Garden and The Nursery Theatre, Liverpool Street. Christian has travelled to Asia many times this year teaching at universities nationwide and teaching over 300 professionals to use drama and performance in schools. Christian was appointed Director of Junior Musical Theatre at the prestigious Arts Educational Schools, London and created "Schooldays - A Musical Revue". Christian also directed and choreographed The Addams Family for SITM and Memo Arts Centre and the brand new musical "We Are Monsters". Christian has co-founded a new international brand with Joseph Mees in September 2018 called Dramalang®, which is a drama teacher training and resource company. For the rest of 2018, Christian will be working with his international colleagues in New York, London and China on a range of musical theatre and drama related projects. He will also be acting as an associate director and choreographer for Immersion's "Beauty and the Beast". Christian still travels to Wales on Sundays to offer his students the very best training. 2017: Christian is worked as an associate to award winning producer Katy Lipson on a variety of projects. Notably, Promises Promises (Southwark Playhouse, London), Some Lovers (Southwark Playhouse, London), Lizzie (Greenwich Theatre, London), From Page to Stage Season of New Musicals (The Other Palace, London), Hair the Musical (London). He is was co-producer for an international arts training in Guangzhou, China. Christian was assistant director of "When Midnight Strikes" in London. He is also presented the Welsh premiere of “The Amazing Adventures of Superstan”, as a youth production in Wales, and created a new musical revue show called "NYC" for SITM and Memo Arts Centre. Christian directed a selection of musical theatre readings for Theatrical Rights Worldwide at The Other Palace. Christian was also associate director and choreographer for Immersion Theatre's professional pantomine "The Wizard of Oz" in London. 2016: Christian negotiated a new location for SITM China, which is now situated in Beijing. He directed & choreographed Disney’s High School Musical in Wales and spent the latter part of the year negotiating new partnerships. 2015: Christian assisted award winning director and choreographer Andrew Wright on Broadway to the Bay (Wales Millennium Centre) and Oliver! (Leicester Curve). He also produced, directed and choreographed West Side Story (Memo Arts Centre). He also choreographed Bugsy Malone and directed & choreographed Follow the Star for Nik Ashton’s youth theatre (PYT). 2014: Christian launched his brand Superstars in the Making® in China. He also co-produced a new musical theatre course for people age 14+ at Howell's School Cardiff with Connie Fisher. He produced, directed and choreographed Hairspray (Memo Arts Centre) and sold-out the 900 seat theatre for every performance. 2013: Christian devised and co-produced Star of Stage UK, a national musical theatre competition. He also worked with Connie Fisher to launch The Connie Fisher Academy. He worked alongside Kirk Jameson (Director), Caroline Sheen, Nik Ashton (Resident Director of Matilda the Musical London), Matt Brind (West End Musical Director) & David Mahoney (Only Men Aloud/ Producer). He also produced, directed and choreographed Grease (Memo Arts Centre) and sold-out the 900 seat theatre for every performance. In 2012 Christian secured a summer co-production deal with the 900 seat Memo Arts Centre to produce Fame.